The light falling weight deflectometer is from now on used for the compaction test on the Warsaw tram construction sites. 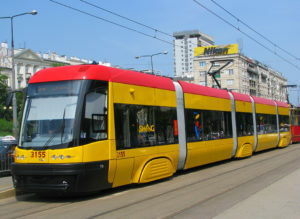 The “Warsaw Tram” ordered two TERRATEST 5000 BLU light falling weight deflectometers with Bluetooth technology. After the devices were handed over, the construction site workers were instructed by TERRATEST personal how to use the device and analyze the measurement values. “Tramwaje Warszawskie” has chosen TERRATEST’ light falling weight deflectometers due to the simple design of operation and the extensive and innovative features of the device. Especially the Bluetooth technology was the main reason for his decision. This makes it possible that a measurement can reach to even hard- to- reach sites without cable connection. The light falling weight deflectometer is now used for the construction work with the adaptation of the rail network for the operation of modern low-floor trams . The use of the light falling weight deflectometers optimizes the construction supervision and supports the coordination of compaction tests implemented by construction companies.